Have you heard the phrase ” a diamond in the rough”? If you are unfamiliar with the phrase, it is often used to describe someone who is generally of good character but lacks style or polish. This phrase was inspired by the process of taking a raw diamond into the brilliant multi-faceted diamonds we covet today. When diamonds are first mined from the earth, they do not look like what we see in stores. The process of transforming natural diamonds into the brilliant and gorgeous stones we love requires the hands of a skilled professional. The process of producing a cut and polished diamond requires five steps: planning, cleaving, bruting, polishing, and inspecting. A professional diamond cutter must first assess the stone. The cutter uses their experience and knowledge to determine how to cut the diamond in a manner that will maximize waste. By carefully inspecting the rough stone they can tell what shape will give the best results. The planning process itself can be very time consuming as this step will determine the final value of the finished product. After deciding how to cut the diamond, the stone is reduced to a manageable size by a process known as cleaving. To cleave the gem, the cutter finds the diamond’s weakest plane. With the gem held in a mold, the cutter carves a groove along the correct plane. Once the groove is complete, a steel blade is placed in the slot and struck, cleaving the rough stone in two. Often there is no apparent weak plane, and the diamond cannot be cleaved. In this case, the stone is cut using a high-speed phosphor-bronze blade. Lasers may also be used to saw diamonds, but the process is very time-consuming. Whether cleaved or sawn, the cutter decides during this step which part of the diamond will become the flat area with the largest surface and which will become the outside rim of the stone with the greatest diameter. The bruting and cutting processes give the stone its final shape. Diamonds are the hardest substance known to man so only another diamond can be used to cut and shape the stone. 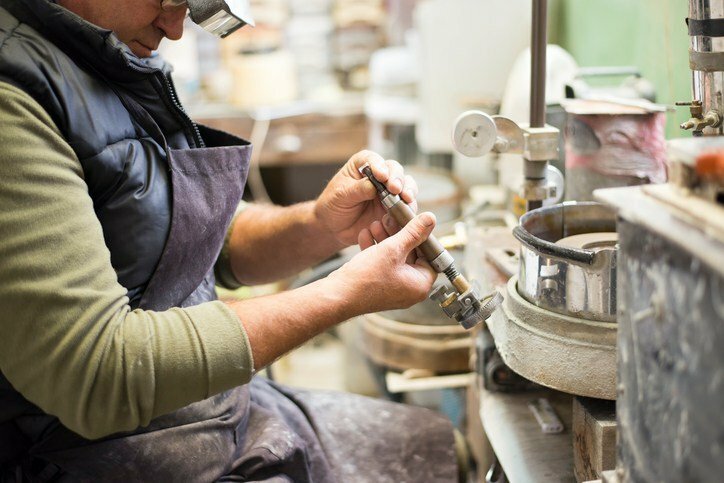 When done by hand the shaping process is known as bruting When performed mechanically using a lathe, the process is called cutting. With the shape of the diamond formed, the polishing process develops the facets and creates the final look of the stone. In the polishing procedure, the cutter places the gemstone above a rotating polishing wheel coated with abrasive diamond powder. Pressing the diamond against the wheel polishes and finishes the stone, creating the smooth, reflective facets of the diamond. The final stage is the inspection process. In this process, the diamond is inspected to ensure that it meets the specifications set by the manufacturer. If the stone does not pass the inspection stage, it is sent back to the polishers to ensure that it meets the quality control standards. Creating the perfect diamond from a raw stone requires the skilled hands of experienced craftsmen and may take months to complete. Finding the highest quality diamonds requires an intimate knowledge of every aspect of the diamonds production. At The Diamond Reserve, we only carry the highest quality to ensure that we only carry the highest quality GIA certified diamonds. Denver’s premier diamond broker and fine jeweler, The Diamond Reserve, specializes in custom diamond engagement rings, GIA certified loose diamonds and fine gemstone jewelry. The Diamond Reserve in Denver operates differently than a retail store and is revolutionizing the way that consumers shop for diamonds. To learn more about diamonds custom fine jewelry contact us today.